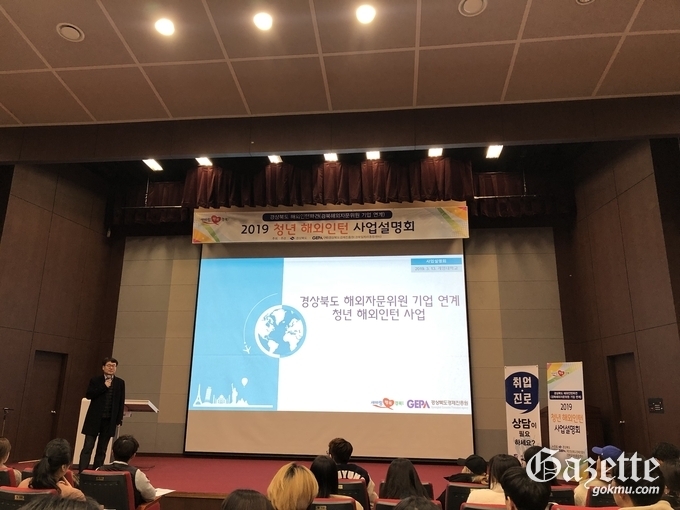 On March 13, 2019, the Economic Development Institute of Gyeongsangbuk-do held a presentation on an overseas business internship for students at Keimyung University. The Youth Overseas Incentive Project aims to provide young people with various opportunities for internships to create jobs for young people overseas. The company plans to expand the search for various companies, hire headquarters-focused interns, and find excellent internship applicants with local universities in connection with overseas advisory committees in North Gyeongsang Province. The departments they recruit include design, marketing, logistics centers, personnel, etc. It is responsible for various promotional materials,leaflet production and installation, and supports events at new and existing stores.